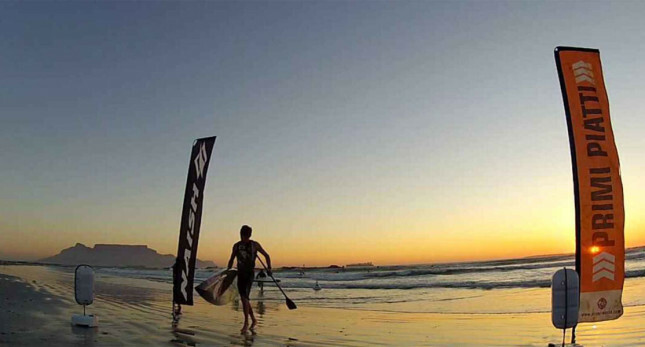 The summer winds kicked in 5 days prior to first our race night and many SUP’s, surf skis and a lonely OC6, took advantage by clocking numerous practice runs. It was the first race of the 2013/2014 PRIMI Naish downwind season after a 6 month hiatus. Wind co-operated, albeit on the softer side of what we are used to in Cape Town, with a gentle 10-15knots creating just enough bumps for the field to enjoy some runners. 36 SUP’s took to the start with some of the more hardened downwind guys staying at home waiting for windier days. We were also missing championship contenders such as Chris Bertish, Ethan Koopmans and Ivan van Vurren due to other commitments – Ethan has gone to Las Vegas for the Naish One N1SCO World Championship and we wish him the best of luck for this weekends racing! Dylan Frick, now 18yo, has matured into being the man to beat and he chose to use his flatwater Sprint for the gentle conditions. He, as per usual, blitzed the start and set the pace from start to finish. Another youngster, 16yo Joshua Robertson, took pursuit on his LE and finished a fine 2nd. In third place was Greg Bertish on his 14’ Bullet, he is 6 years older than the two in front of him combined and he just managed to pip another youngster, 16yo Kimon Dos Santos, also on a 14’ Bullet. So the youngsters are making a nuisance of themselves early in the season – and not just on the Mens side, 15yo Mishka Steyn, also on an LE, managed to beat the reigning champ, 38yo Brigette van Aswegen and her Allstar by a mere 3 seconds! In third we had Monika Wohlgemuth on her trusty Glide. In the Masters over 45 division Pietro Muscas brought his Allstar home ahead of Peter Petersen on the LE with Gary van Rooyen of Coreban in 3rd. Tonights race was the first time we had ever used a RFID/chip system for a SUP race in South Africa and it was a great success. The Wild Timing system is unique in that it is fully portable, wire-less, battery-powered and with no need for leads or mats – it’s WIFI enabled and fully live provided you have an internet connection and uploads pics of each competitor as they cross the line as well. All paddlers will keep their tags for the season and checking in will be a swipe and you are sorted. Thanks Wild Timing for assistance with time keeping – it makes a huge difference!